Located just off Dupont Circle, in a very nondescript location with a small jester on the awning is some of the freshest Italian food in DC where as much as possible is cured, made by hand, or done in house. This is all occurring at the hands of Italian born Chef Luigi Diotaiuti, with bow-tie pasta for Chef coat buttons and a red scarf around his neck at Al Tiramisu. Sourcing locally from markets around DC, having fresh fish brought in from Italy and other places, and curing his own meats and making his own jams, this place is truly his passion envisioned. 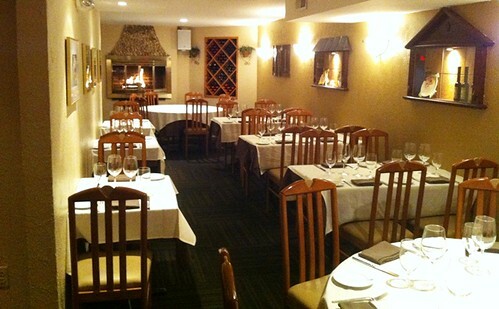 The decor is warm and welcoming with a crackling fire in the colder months. 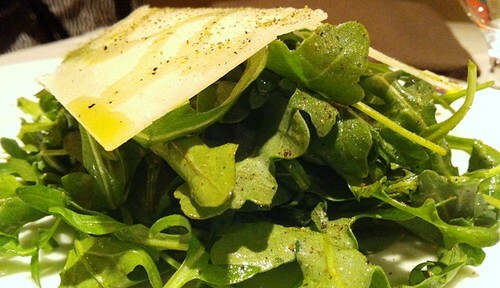 For starters, you can’t go wrong with a lightly dressed peppery arugula salad topped with shaved parmigiano reggiano and fresh cracked pepper. Ask the Chef what house cured meats he has that might not be on the menu. The beef carpaccio with arugula and aged parmigiano reggiano is always available, but see if there is something special in the back. Pictured below is the house-cured duck prosciutto with house made marmalade that was rich yet sweet. The balance was perfect with the strong salty duck flavor. For the main course, any of the house made pasta options are great, but if you want something lighter, the Chef has an amazing seafood collection – and he’ll show it to you as well. Ask what’s fresh, or what he recommends, and you’ll receive a beautifully filleted fish prepared simply to highlight the delicacy and purity of the ingredients. A little lemon and some pepper and you’re in heaven.